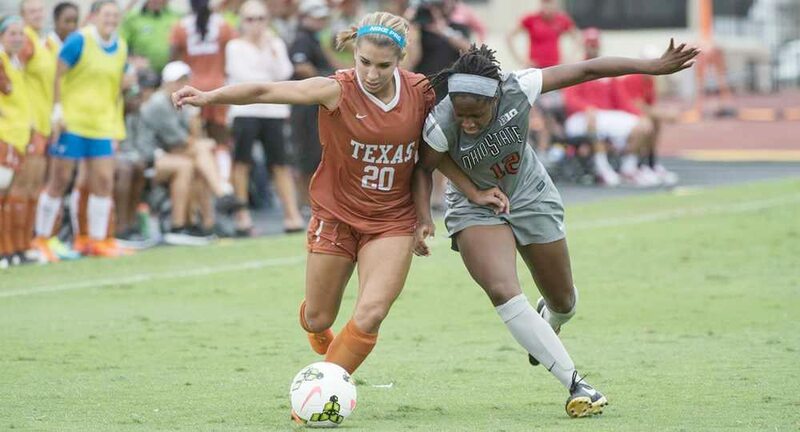 Forward Mikayla Flores earned Big 12 Freshman of the Week honors after scoring the tying goal in UT's upset of Texas Tech (photo courtesy of texassports.com). Days after helping to lead the University of Texas women’s soccer team to an upset victory at Texas Tech, senior goalkeeper Abby Smith and freshman forward Mikayla Flores were named Big 12 Defensive Player of the Week and Big 12 Freshman of the Week, respectively. Smith piled up 10 saves against the Red Raiders, who were ranked No. 17 in last week’s National Soccer Coaches Association of America (NSCAA) poll and also had an assist on junior forward Jasmine Hart’s game-winning goal with just 21 seconds left in the second overtime period. Flores, meanwhile, scored the tying goal and led the offense with four of UT’s 10 shots, including three shots on goal. She has two goals and two assists this season, and is tied with senior forward Kelsey Shimmick for third on the team with six points. The accolades Smith and Flores received from the Big 12 mark the third consecutive week in which the Longhorns have had at least one player recognized by the conference. The Longhorns will be back in action at 6 p.m. Friday, Oct. 23, when they host Oklahoma, and at 4 p.m. Sunday when they host Baylor. The matches, which will close out the Big 12 part of the schedule, will be held at Mike A. Myers Stadium, and will be broadcast live on the Longhorn Network.